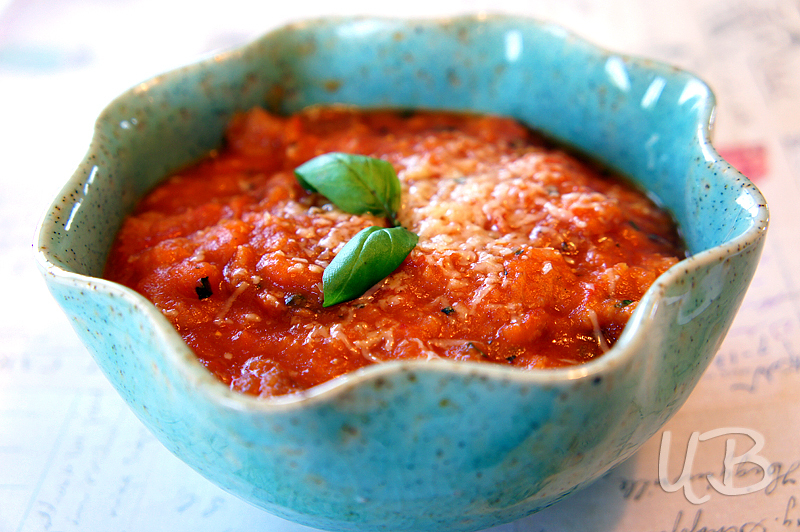 I think I can honestly say that this Pappa al Pomodoro recipe is my most absolute favorite soup. (It’s from Anne Burrell and she is a cooking genius and I want to be her best friend!) It is delicious in the winter when you want to snuggle up on the couch with hot soup in hand and it is incredible in the summer when you can pick up some plump tomatoes right at your local farmers market. I’ve made this soup several times now and it gets better with each new batch. I received some real validation this winter when my full Italian brother-in-law told me that it was delicious! That same Italian brother-in-law also made it very clear that Reisling wine does not go with every meal (major faux pas at a nice restaurant on my part)…but I do prefer to substitute the white cooking wine in this recipe with my favorite Pacific Rim Reisling. It just seems to add that amazing extra something! Oh and I learned a great new trick a few months ago…if you are using fresh herbs in a recipe, instead of chopping them up, you can freeze them first and then just crush them with your hands. This recipe is slightly adapted from the incredibly talented Anne Burrell, host of Food Network's "Secrets of a Restaurant Chef." Coat a large wide pot with olive oil and heat it over medium heat. Add in the onions and season with salt and crushed red pepper, cooking until the onions are soft and very aromatic (about 8 to 10 minutes). Toss in the garlic and cook for another 2 minutes. Add the wine and cook until it has reduced by half. Stir in the tomatoes, season with salt, and cook until the tomatoes are really soft and juicy, about 12 to 15 minutes. Then toss in the whole basil leaves. Return the tomato puree to the pot and add the tomato juice and the bread. Cook the soup over medium heat for about 20 minutes, until the bread has lost its shape and the soup is really thick. Ladle the soup into bowls and serve them garnished with grated cheese, basil chiffonade, and a drizzle of olive oil. Enjoy the BEST tomato soup ever imagined. FYI: This ‘soup’ is rightly named as pomodoro means tomato, and pap means something soft.